Advanced technology: Improved texture control, stronger milling heads, unique Force Flow sound/air chamber design which results in 50% noise reduction, improved motor cooling, and longer life. Protects nutrients: The NutriMill Classic keeps your flour at temperatures typically about 118° that protect the nutrients in your grains. 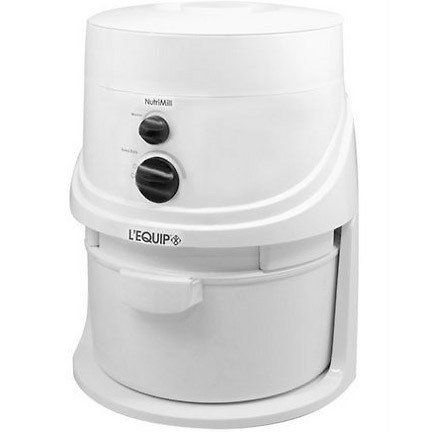 Powerful 10 amp, 1-3/4 hp motor quickly produces your choice of fine, medium or coarse flour. Grind up to 5 cups of flour per minute. Super fine or coarser flour, your choice! 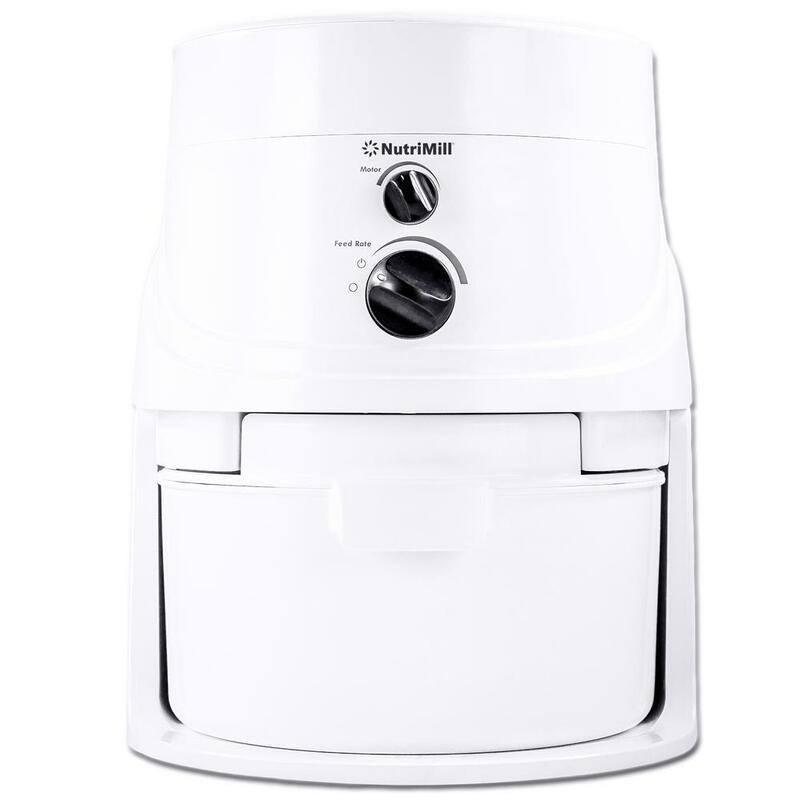 The NutriMill Classic electric grain mill uses a high speed impact chamber (also called a micronizer) to create flour from grains and beans, a modern and well-proven milling design. The NutriMill Classic has raised the bar for grain mill design with new features and abilities users have asked for—a combination of features found in no other impact mill. 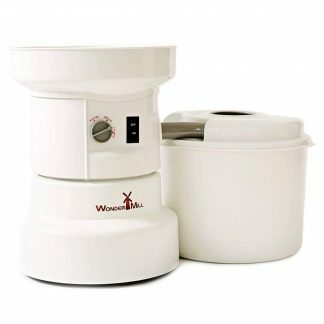 The first of these is the ability to grind super fine flour, much finer than any other impact mill, and also adjust to produce the coarser flour grind you need for perfect corn bread. Its impact grain milling heads provide a 400% range of adjustment from fine to coarse, ten times greater than earlier impact mills. 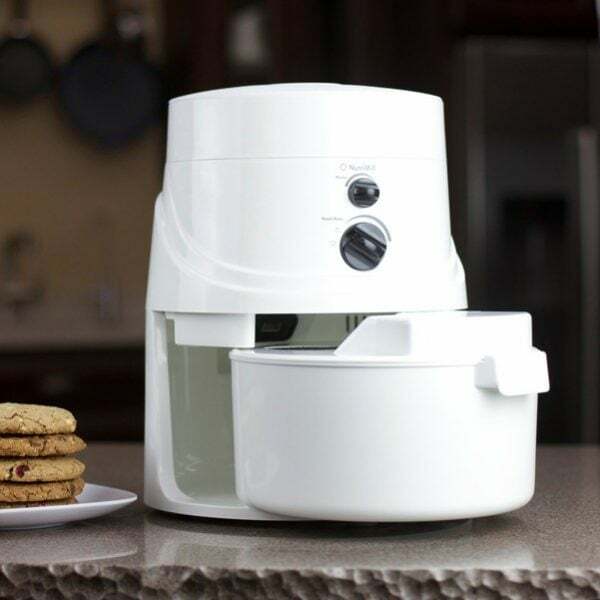 NutriMill is the world’s most popular maker of grain mills, and the NutriMill Classic turns out terrific flour quickly and easily! Convenient, powerful & fast: Just pour grain in the hopper, turn the NutriMill Classic on, and its powerful 10 amp, 1-3/4 hp motor does the rest, quickly producing your choice of fine, medium or coarse flour. The NutriMill Classic’s impact grinding mechanism is self cleaning, and it operates dust-free, so grinding grain won’t mean extra housecleaning later. Easy-grip handles and light weight make the NutriMill Classic easy to move. 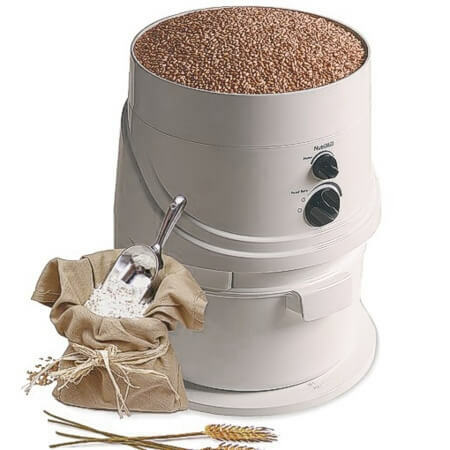 The versatile NutriMill Classic grinds wheat (both hard and soft), oat groats (dehulled oats), rice, triticale, kamut, spelt, dry beans, lentils, dent (field) corn, popcorn, dried sweet corn, split peas, buckwheat, barley, rye, millet, teff, quinoa, amaranth, sorghum, dried mung beans and soybeans. It will also grind dried, minimally-sprouted grain. The NutriMill Classic isn’t suitable for herbs, spices, oilseeds like flax, chopped chestnuts, rolled oats or fibrous materials. 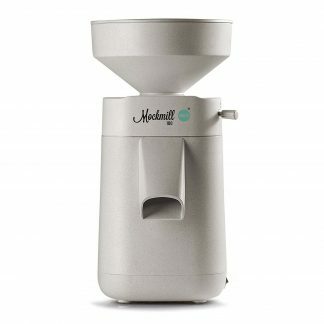 Grains and beans that have already been milled can’t be milled again in any impact mill, including the NutriMill Classic. Also note that when set for coarser meal texture, the NutriMill Classic’s output remains too fine for making cereal grinds. The Nutrimill Classic is an outstanding machine for making a full range of flour and meal textures. The new design of the NutriMill Classic’s impact chamber allows you to put grain into the hopper before you turn it on with no risk of plugging the mill, which can happen with older designs. Even if stopped during grinding, the NutriMill Classic restarts again without trouble. This is a crucial design feature for an impact mill. Protects nutrients: The NutriMill Classic keeps your flour at temperatures (typically about 118° in our testing) that protect the nutrients in your grains. Its new airflow design makes the NutriMill Classic the world’s coolest-running impact mill. Our customers love their NutriMill Classics! Our experience spans the milling spectrum from home-use to commercial. We’re here as your resource before and after the sale, and we’d be delighted to visit with you about a NutriMill or any aspect of your milling needs. We’d appreciate your business, and we look forward to serving you in any way we can! The NutriMill Plus is now available with unique features of its own, including even larger capacity, and smaller storage size. The Nutrimill Classic continues to be one of our best selling mills, but be sure to check out the new NutriMill Plus to choose the best grain mill for your needs! Imagine that your children ate mainly candy… for years. Imagine that you did, too. Imagine an entire nation on a candy diet. Imagine the health consequences. Natural whole grains contain a myriad of health-essential nutrients, from proteins to vitamins and amino acids. But “white flour” consists only of the starchy endosperm of the wheat kernel. In its natural form the endosperm provides wholesome energy, but it’s the least nutrient-rich part of the grain. Removed are the nutrient-packed bran, wheat germ, and wheat germ oil. Then to make it extra white, industrial processors go further, chemically bleaching it, and returning just enough of a few vitamins to stave off beriberi and rickets. They’re allowed to call the end product “Enriched Flour” but a truthful label would read “Impoverished Flour.” This snow white, denutritionalized substance is a commodity worth billions of dollars annually to its merchandisers because of one peculiar and commercially useful characteristic: Unlimited shelf life. No matter how long it sits in the mass distribution channel, it can’t “go bad” precisely because there’s nothing left in it that can go bad. Nutritionally, it’s bad when bagged. A few companies have grown enormously rich marketing this pseudo-food on the basis of convenience, ease, and its “dazzling white” look. But a blind eye was turned to the consequences of replacing real whole grain flour with something that looks special, yet is virtually devoid of nutrition… in essence, candy. So widely has this nutritional travesty become accepted that we call it — and think of it as — wheat flour. But to depart further from natural grain flour would scarcely be possible. Then to make matters worse, artificial sweeteners, flavors and colors, appetite stimulants and preservatives are added to many of our foods. “Artificial” tells you those things aren’t naturally food… but have you ever wondered what they actually are, then? And what the unintended side effects of those complex counterfeit compounds might mean to your body? The human body is an absolute marvel… Science has a long way to go to understand a tenth of how we work. But as capable and as resilient as our bodies are, common sense and history teach that we need wholesome, nutritious food to stay healthy and strong. The denatured by-products being mass marketed today don’t provide us with what we need, because they’ve been profoundly altered by processes in which real nutrition is considered last, or not at all. Making REAL food is more than “doable”… it’s downright fun! 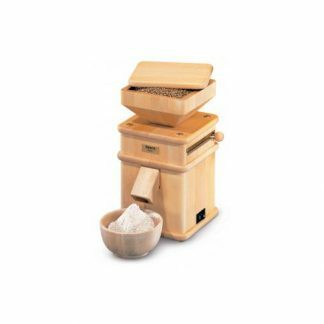 A high speed self cleaning grain mill like the Nutrimill is the place to start. And to make whole grain bread quickly, easily and with consistently wonderful results, nothing beats the Bosch Universal Kitchen Center… a full-function mixer capable of both mixing and kneading bread that’s ready to pop in the oven — quickly and without hand kneading. These machines make it easy to turn the corner to a far better and more enjoyable way of eating! Plant Based Pros offers many grain mill choices, both electric and hand-crank. Click here to see all grain mills.